What is the best way to begin memorizing? Simple. READ IT, but don’t be lazy. Read your memory verse in context thoughtfully and slowly. If you are memorizing a portion of a larger work, I recommend that you read through the entire chapter (or story) on the first day. If you are using SMF books, I recommend that you read through all of the commentary on the first day. Consider day 1 to be your overview. You want to have a general idea of the verses and what they mean. Now, the repetition begins. Read your memory verses aloud five times emphasizing different words each time. Try to make a visual memory of what the words look like on the page, then close your eyes and try to "read" your verse in your "mind's eye." 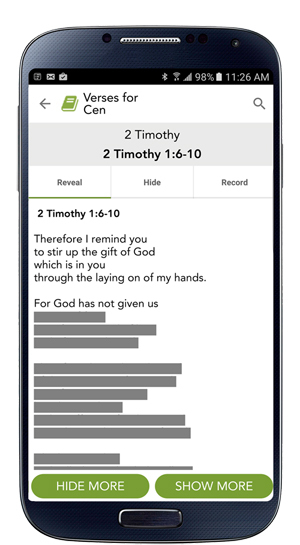 Our VerseLocker app never places more than eight words on each line. Ancient memorizers called this an “eye’s glance.” The essential brevity of each line allows you to retain the short series of words in your short-term memory. In psychology, this is called The Magical Number Seven, Plus or Minus Two. Short-term memory can only remember around seven things at a time. You should read your verses aloud as much as possible. Leveraging your sight and sound will help make a lasting memory. Retaining words better by saying them aloud is sometimes called the production effect. It is proven that memories created across multiple senses at one time tend to be recalled more accurately (i.e. sound and sight working together). If you are working with small children, or if you consider yourself to be young at heart, I recommend making a game of your recitations. Read it forcefully, read it softly, read it with an accent…you get the idea. What is learned with pleasure is learned full measure. I like to read through my verses while I am waiting in line or on my lunch break. These few extra minutes of “redeeming the time” (Eph. 5:16) give me opportunity to reinforce my short-term memory. However, these occasional readings do not qualify as reading thoughtfully and slowly. The bulk of my quality memory work usually happens either early morning or late evening when distractions are minimal. I prefer to read and memorize one line at a time. I will say the first line out loud three times, then try to say it without looking. If I succeed, then I move to line two and say it three times. Then I try to say line one and two together without looking, etc. This entry was posted in Methods on January 30, 2019 by Katy Hill. Memorizing Scripture does not by itself make a person Christ-like or spiritual. In fact, memory work is the easy part. Many actors, singers, and scholars can quote God’s Word precisely and even forcefully. But that is not the same thing as knowing God. Allow me to repeat: memorizing is the easier part of internalizing God’s Word. And here’s why: memorizing Scripture, properly executed, is never mere data storage. We may never equate rote knowledge of Scripture with spirituality. On the contrary, God’s Word aims at nothing less than transformation of the heart, mind, and soul into Christ-like character, the image of God restored to its original purpose. God’s Word makes it plain that He is deeply committed to this process, so committed that He causes “all things” to “work together for good to those who love God, to those who are the called according to His purpose.” What is that purpose? That those whom He foreknew, He “predestined to be conformed to the image of His Son, that He might be the firstborn among many brethren” (Rom. 8:28-29). So how does memorizing Scripture fit into that process? The content of God’s Word absorbed into our minds becomes the equivalent of computer code, written instructions for how the heart and soul should work. Internalizing God’s Word makes that code part of our psyche, where the Holy Spirit can use it. There will be effort here. Let us be clear—effort does not merit salvation or grace. Grace is still grace. But godly, disciplined effort is a response to grace. “To this end I also labor, striving according to His working which works in me mightily” (Col. 1:29). “… Work out your own salvation with fear and trembling; for it is God who works in you both to will and to do for His good pleasure” (Phil. 2:12-13). Memorizing Scripture is a means to the ends of meditation, fellowship, obedience, and wisdom. It is instrumental. And it is challenging. But almost always what we live out in our lives we have thought about. Let’s fill our thoughts with God’s truth, so that our lives on the outside will reveal something good inside. This entry was posted in Motivation on January 14, 2019 by Jim Woychuk. The Dallas Cowboys beat the New Orleans Saints last night here in our fair city, and it brings up an unpleasant topic: it’s become very fashionable and acceptable in our culture to “beat the saints” verbally. Criticism of Christians’ bad behavior seldom takes a holiday. Whether it’s the latest moral failure of a pastor, past centuries’ bloody persecutions perpetrated in the name of Christ, or just the garden-variety failures of believers who say one thing and live another, pundits within and without the church engage in this spectator sport with gusto. This entry was posted in Devotions on November 30, 2018 by Jim Woychuk. Idols are lies. Concerning idol-worshipers, Isaiah says, “A deceived heart has turned him aside; And he cannot deliver his soul, Nor say, ‘Is there not a lie in my right hand?’” An idol is a lie of such powerful deceptive power that it actually blinds us to its existence. We don’t realize the idol’s existence or power over our thoughts, actions, and destiny. It’s in the palm of our hand, but we don’t see it. And idols intoxicate millions. This entry was posted in Devotions on October 15, 2018 by Jim Woychuk. "And He said to them, 'Why are you troubled? And why do doubts arise in your hearts?'" Indonesian teenager Aldi Adilang knows what hopelessness feels like. While aboard his floating fish trap this summer, strong winds snapped his anchor lines and he drifted out to sea without so much as a paddle. In the days ahead, Adilang watched helplessly as more than 10 ships passed in the distance. Tragically, none of them stopped to help. As days turned into weeks, he survived by filtering saltwater through his clothing and catching fish. This entry was posted in Devotions on October 1, 2018 by Dakota Lynch. We’re all creatures of habit. Whether you’re making breakfast, hanging laundry, or driving to work, certain parts of your day are so routine they require little thought or attention. That’s why you sometimes can’t remember whether you locked the door or turned off the lights on your way out; it’s so habitual, it’s almost mindless. Some habits, like brewing coffee, are easy to maintain. Nobody reminds me to stumble towards the Keurig each morning and push that flashing button. The taste of coffee isn’t quite my favorite, but as I face 16 hours of busyness, I know I need the energy contained in that little cup. This entry was posted in Motivation on September 14, 2018 by Dakota Lynch. In 2008, the world watched in amazement as Michael Phelps made Olympic history. One of the most talented swimmers of all time, Phelps won 8 medals just like he'd done 4 years earlier. But this time, they were all gold. Michael Phelps wasn't just talented; he was unbelievably committed to his sport. His weekly routine consisted of 6 hours of training, 6 days a week -- swimming a grand total of nearly 50 miles during that time. He also followed a specialized 12,000 calorie diet, slept 8 hours each day, and took a 2-3 hour afternoon nap. All those gold medals weren't the inevitable result of natural talent; they were the fruit of unwavering discipline and relentless effort. This entry was posted in Motivation on August 21, 2018 by Dakota Lynch. Every person you meet fights a hard battle. The smiling friend with whom you just had lunch faces fiery trials that would break your heart if you knew them all. But God’s Word enables us to come through the fire. A heart nourished on words of truth acquires an asbestos-like quality, which fire may purify but not destroy. Not too far from Big Cove, Alabama stands a solitary reminder that some things outlast fire and storm. The house is gone without a trace, but its hearth and chimney stand tall, straight as the day they were made. They show us that building materials may be combustible or non-combustible, flammable or fireproof, perishable or imperishable. When fire comes, all is consumed but the permanent things, the things made of lasting stuff. This durable chimney reminds us to build our lives of materials which remain certain and solid despite the flames. Jesus says the wise man hears His words and does them. Such a person builds his house on the rock (Matt. 7:24), and that house proves to be stormproof! In the same way, we make choices every day that are filling our lives, building our lives out of materials from one category or the other. What are you importing into your heart to prepare for the storms sure to come? The time is now—let God’s Word find its intended home in your heart. It is permanent. “Heaven and earth will pass away, but My words will by no means pass away” (Matt. 24:35). It is the anvil that wears out the hammers, and its promises will come true when the skeptics and critics and all their vaunted theories lie quiet. This entry was posted in Devotions, Motivation on July 12, 2018 by Jim Woychuk. The pathway to life is clearly marked in Scripture. Only through God’s Word do we understand that “… we are in Him who is true, in His Son Jesus Christ … ” (1 John 5:20). But all too often, this life-changing truth is forgotten as distractions of every sort beg our time and consume our energy. When unexpected busyness floods our schedule, Scripture memory and other spiritual disciplines are often the first to be sidelined. The result? We forget who we are in Christ because we’re too busy remembering who we are to everyone else! As we consider what it means to follow Christ, John’s closing appeal to keep ourselves from idols (1 John 5:21) is particularly relevant. In response, let us deal swiftly and ruthlessly with any idols that keep us from fully knowing and abiding in Christ. Indeed, “… This is the true God and eternal life” (1 John 5:20). This entry was posted in Motivation on June 5, 2018 by Dakota Lynch. Years ago, a hobbyist chicken farmer in Missouri was asked, "If I start raising chickens, when can I expect to start making some money?” The chicken farmer simply smiled and said, "You don't raise chickens to make money. You raise chickens for the joy that they bring." This entry was posted in Motivation on May 29, 2018 by Dakota Lynch.